I'm always happy to accept custom orders! If you'd like to have a doll made in the likeness of one found in my gallery, E-mail me with the doll number for a price quote. Keep in mind that each doll will have slight variations due to the fact that they are completely hand stitched, I don't use patterns, and the availability of materials used. E-Mail me a description, a photo, or a sketch along with your zip code for a price quote... since my prices vary depending on detail and such. After we've hammered out all the details pertaining to your order you can expect to receive an invoice via PayPal for a $50 non refundable deposit a few days before I begin making your doll. Each doll will take about a week to complete. As soon as your doll is completed I will email you link to several pictures and a second PayPal invoice for the remaining balance due plus shipping costs. I always ship Priority Mail and immediately upon payment receipt with both tracking and insurance coverage. I only accept orders for my 22 inch dolls... I do not accept orders for my11 inch dolls. Copyright © 2003-2019 Jodi Cain All Rights Reserved! 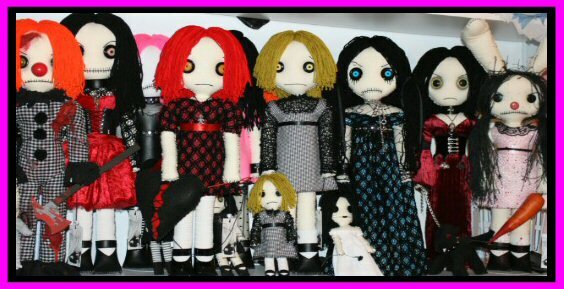 Visit me on Etsy each week to see new dolls!